I joined forces with authors Stacy Gail, Sasha Summers, and Anna Hackett to spotlight A GALACTIC HOLIDAY (Carina Press) at the RT Book Reviews blog! This title is a holiday themed science fiction romance anthology. Since these types of releases are still pretty rare I'm excited about the chance to showcase it in collaboration with RT. Happy reading! All Romance Ebooks is having a Cyber Monday 50% rebate sale, which includes science fiction romance titles! I love it when retailers make this subgenre more accessible. If you have a moment and could tweet the news, that'd be great! You Gotta Read Reviews is holding their annual cover contest and voting has begun. Red Sage Publishing entered my cover for THE BLACKSMITH'S LOVER and it was selected (#19)! It's an honor just to be nominated, but if you feel it's worthy of your vote, you can click here to give it a nod. You can help victims of Hurricane Sandy by bidding on these literary items by best selling authors. Attention SFR Brigade! All hands on deck. LINK - If I don't have the link, I won't go hunting for one. Subject: SFR Brigade Library -ME! If your book is coming out before March 2013 and you would like to schedule a cover release, release day party, or other SFR Brigade fun around your launch, please talk to our calendar coordinator Pippa Jay Green. The Brigade would like to help you launch in style, but we can't read minds (although our R&D department assures me it'll happen soon!). My goal is to have the library updated before December 1st so we can promote SFR Brigade books over the Holiday season. After all, books are the perfect gift! I'm blogging at RT Book Reviews about working heroines in science fiction romance. The more I thought about the issue, the more I realized that what SFR heroines do for a living has seriously strong appeal for me. It's yet another reason to celebrate this subgenre! SAT NOV 10 @11 am at the TCC NW campus. Visit TCC's all day Creative Writing Workshop sponsored by Tarrant County Community College NW Campus. See you there! 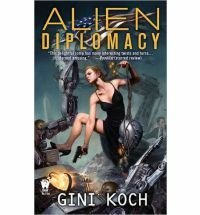 Congratulations to Gini Koch for her 2012 Romantic Times nomination for ALIEN DIPLOMACY in the Urban Fantasy Protagonist section. You can check out the other RT category nominees here. Pat Hauldren (Alley) and Gerald Warfield will be presenting "Creative Science Fiction" at the TCC NW Campus in Fort Worth, TX, this Sat. Nov 10 at 11am. Come for the whole day for the Marine Creek Creative Writing Conference at TCC NW Campus! Nicole Leclerq's book is out! One of my students in the Urban Fantasy class I taught in The Hague last year, Nicole Leclerq, has her book published! TOUCHED BY MADNESS is out, published by Ragz Books. Touched by Madness is a wonderfully chilling read! Go buy it, review it, and let us know what you think!